MALIBU MOON is the sire of 2013 Kentucky Derby-G1 winner ORB! 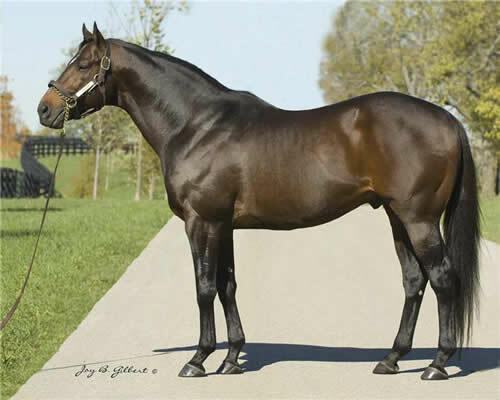 MALIBU MOON began his stud career at Country Life in 2000, and after the success of horses like Perfect Moon in his first crop, he was relocated to Kentucky in 2003. Other offspring of MALIBU MOON conceived during his time at Country Life include Eclipse Champion Two-Year-Old Declan’s Moon and Grade 1 winner Malibu Mint. 2018 racing: Arkansas Derby (G1) and Rebel S. (G2) winner MAGNUM MOON, back-to-back Bing Crosby S. (G1) winner RANSOM THE MOON, Bessarabian S. (G2) winner MOONLIT PROMISE, Davona Dale S. (G2) winner FLY SO HIGH, Shuvee S. (G3) winner FARRELL, etc. 2018 sales: 2-year-olds of $700,000, $500,000, $500,000, $250,000, $205,000, etc. ; yearlings of $500,000, $500,000, $450,000, $450,000, $425,000, $400,000, etc.